One of the perks of freelancing is that you can work from pretty much anywhere. However, the pressures of staying connected to work may leave you stuck behind a computer all day anyway. While there’s something to be said for the levels of productivity and output you achieve from a dedicated workspace, there’s no reason you can’t keep the momentum going while you’re out and about. 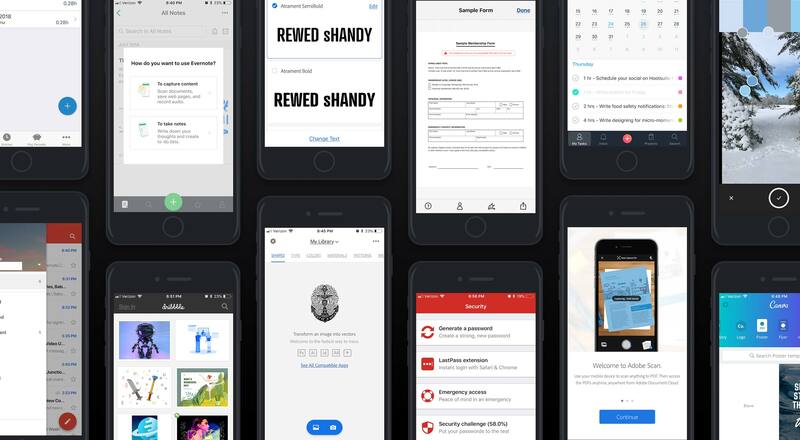 The following list of tools and mobile apps will help you run your web design business—and tackle various tasks associated with it—even when you’re on the go. Let’s say you’re on vacation and feel inspired in the moment. Do you mentally bookmark what you saw or heard in the hopes you can put it into practice when you’re back at work? Or let’s say you’re at the doctor’s office, stuck in the waiting room with nothing to do and a looming deadline. Do you allow yourself to get stressed with each lost minute of work? Or perhaps you prefer having multiple devices from which you can work. Having a smart device that complements your desktop activities would really come in handy then, right? If you’re going to do this—take advantage of the ability to work from anywhere you want as a web designer—then your smart devices need to be equipped with the right kinds of tools. 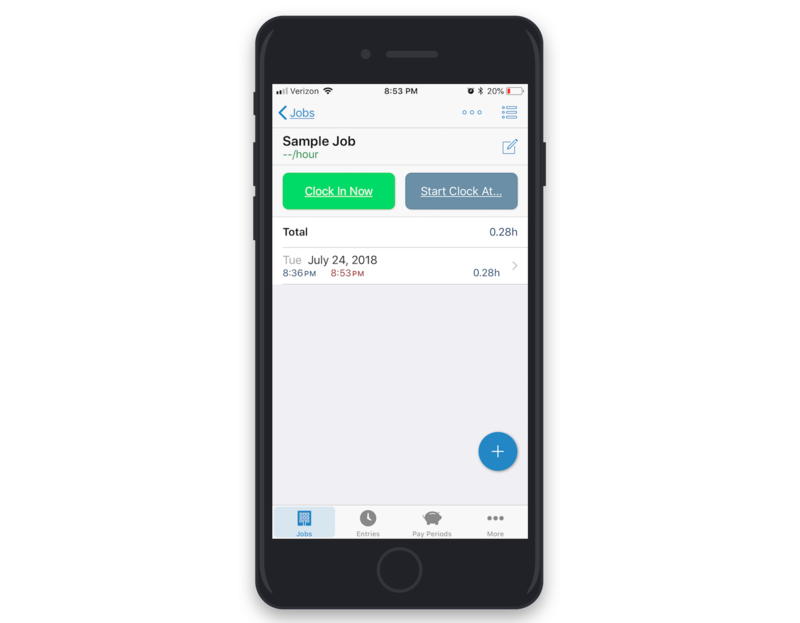 HoursTracker is a free time-tracking app. For some of you, this will come in handy if you bill design clients on a per-hour basis. For others, you can simply use this as a way to keep yourself accountable. If your goal is to work a certain number of hours in a day, a time tracker will keep you committed to it. 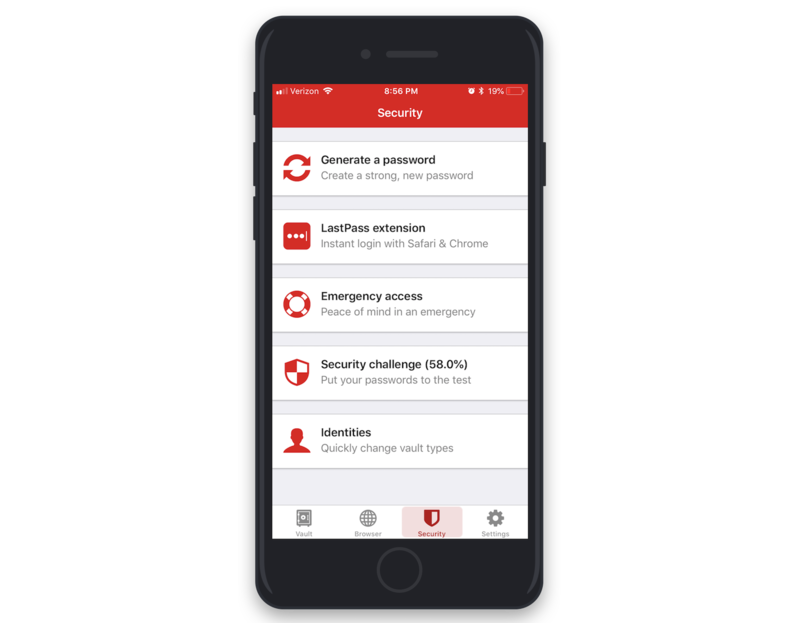 LastPass is a password management tool that’s great at saving you time repeatedly logging into the same websites and apps. Every time you enter a new password into your mobile device, LastPass will give you the option to securely store those credentials. What’s particularly nice about this app is that it also works for desktop, so you can use the same account across both platforms. 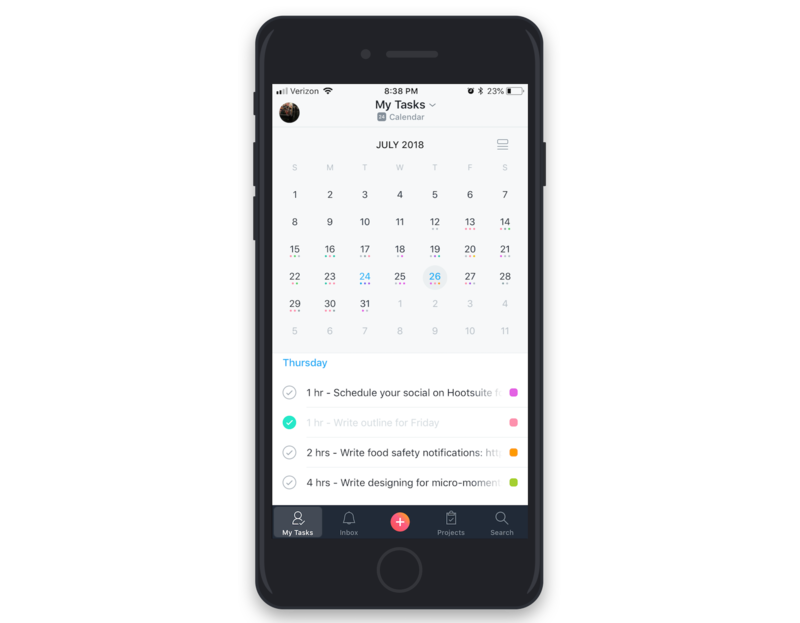 Asana is another one of those productivity apps that works well across all your devices. So, let’s say you’ve gotten into the habit of managing all client details, project tasks, and timelines in your Asana desktop app. With a quick installation of the mobile app, you can take all that pertinent business information everywhere you go. Have you ever found yourself out somewhere and wished you had a pen and paper to take down something you just thought of? 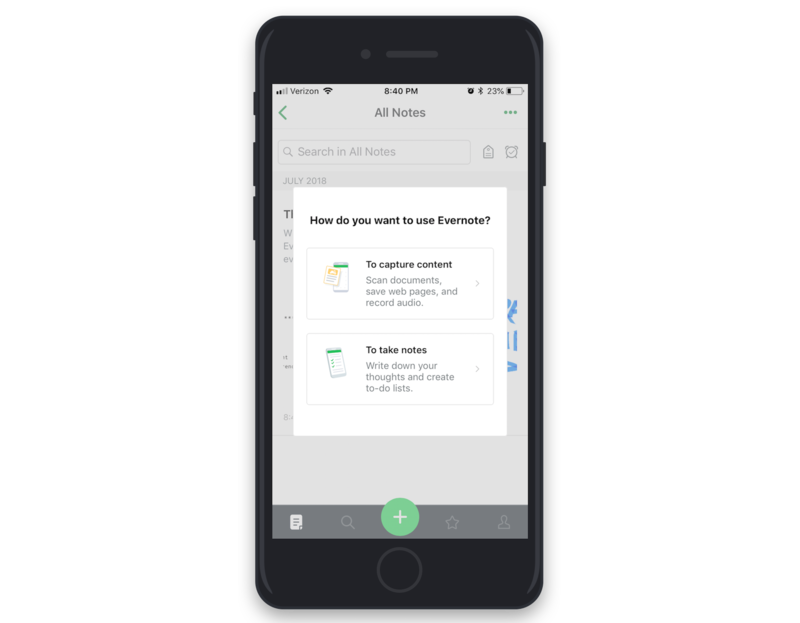 Evernote is a secure way to store these notes, audio recordings, uploaded files, and screenshots all in one place. If you’ve previously relied on your mobile device’s various note, photo, and storage apps to store this kind of information, you’ll find Evernote incredibly helpful in consolidating all your web design-related content into one location. Google Apps are a must-have for anyone wanting to quickly and securely communicate with team members, partners, and clients. 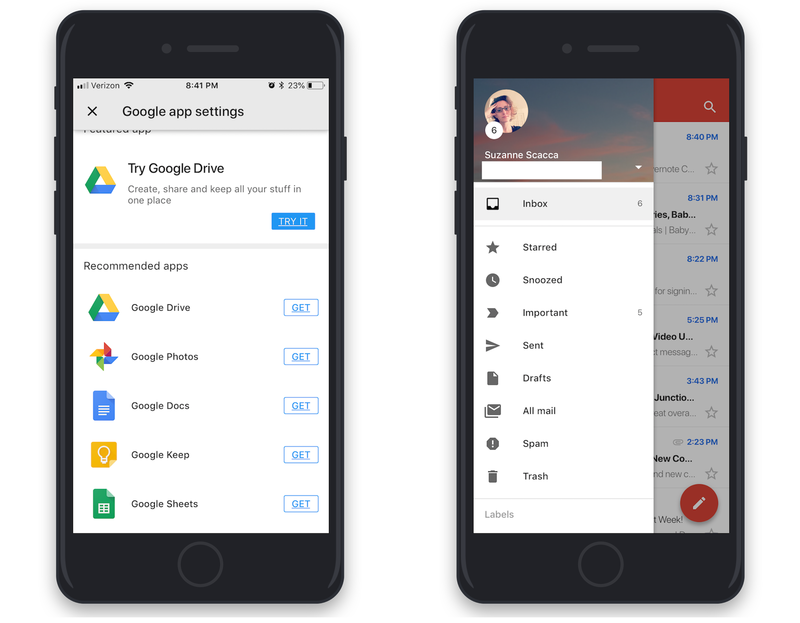 Your access to Google Apps extends beyond Gmail, too. This will enable you to continue creating documents, storing files in shared locations, and communicating with others no matter where you are. Adobe has a fantastic set of mobile applications web designers should be taking advantage of. The first is Adobe Scan. 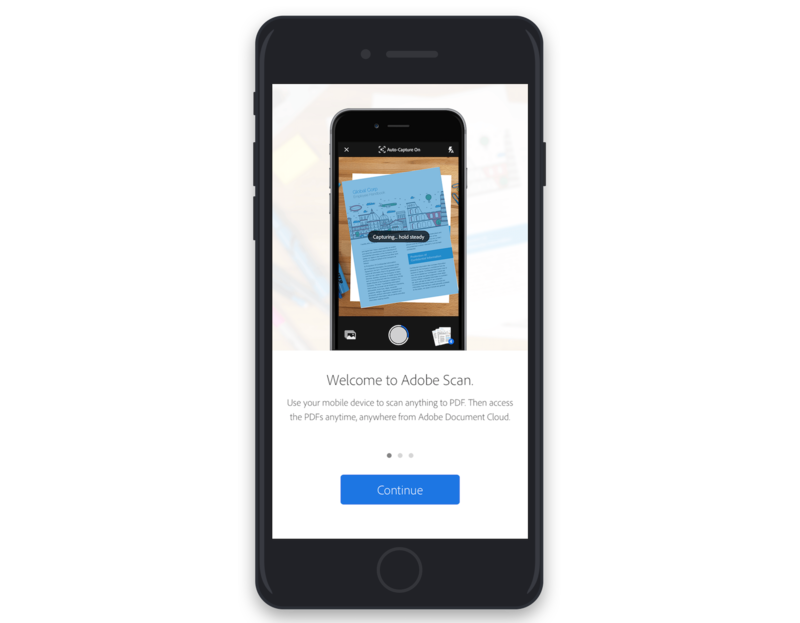 With this app, you can copy and convert any image into a PDF. This would be great for storing receipts from work-related travel. You could use this to scan hand-drawn wireframes or sketches. You could even use this to capture a prospective client’s business card on the fly, so you have a digital copy of their contact information for later. When you’re outside of the office, that doesn’t mean all business dealings have to stop. 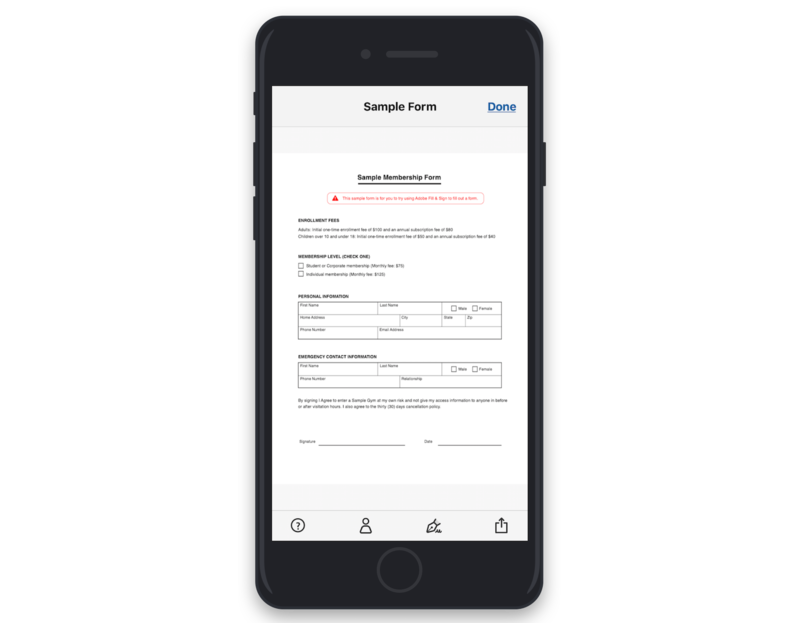 If you’re ready to get that next client project off the ground, Adobe Fill & Sign allows you to upload formal contracts and sign them, all from your mobile device. Adobe Capture CC is perhaps my favorite mobile app for web designers. Two of the more interesting features, are Type and Colors. 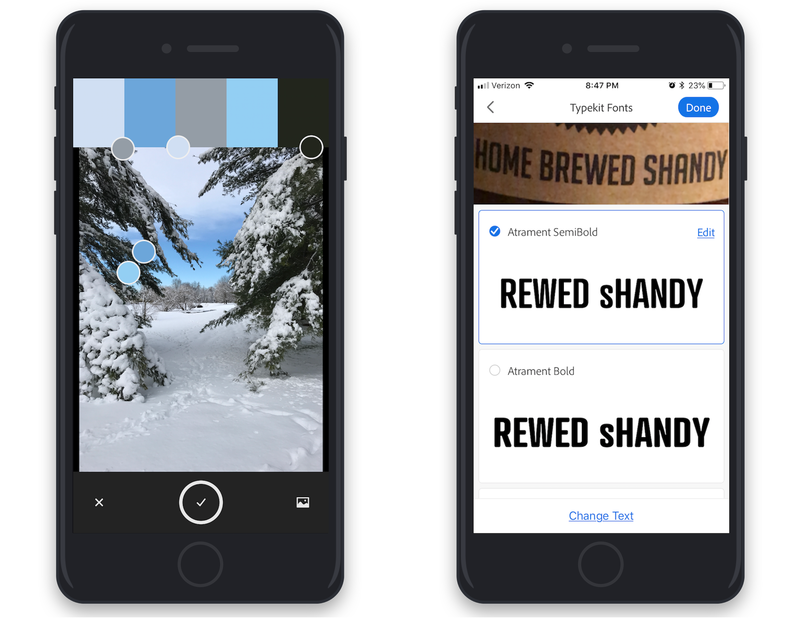 With Type, the app will zero in on any text that exists within the chosen photo. It will then display what it believes to be the matching typeface. If you see really cool signage, flyers, bumper stickers, or anything else that catches your eye, you can use this mobile app to quickly decipher it for you. The Colors feature is another really neat one for web designers. When an image is uploaded to the tool, it will automatically select a complementary color palette. This is not only great for using real-world settings as inspiration in your work, but it’s great for quickly generating color palettes. 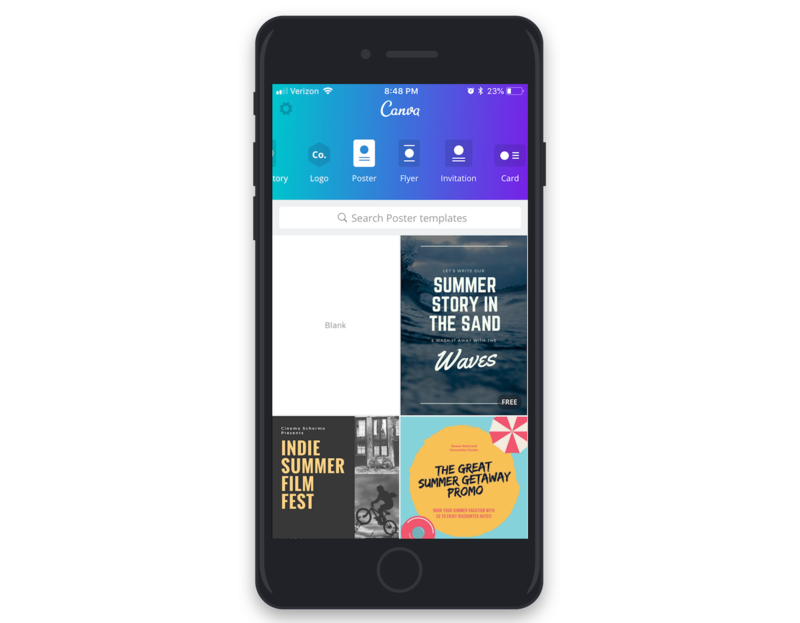 With Canva, you can create all sorts of marketing and social media collateral. Canva isn’t necessarily a tool you’ll be using for website design work. However, if you handle other marketing and design tasks for clients, this would be helpful to have on you at all times. InVision may be a tool you already use to enhance your web design workflows. 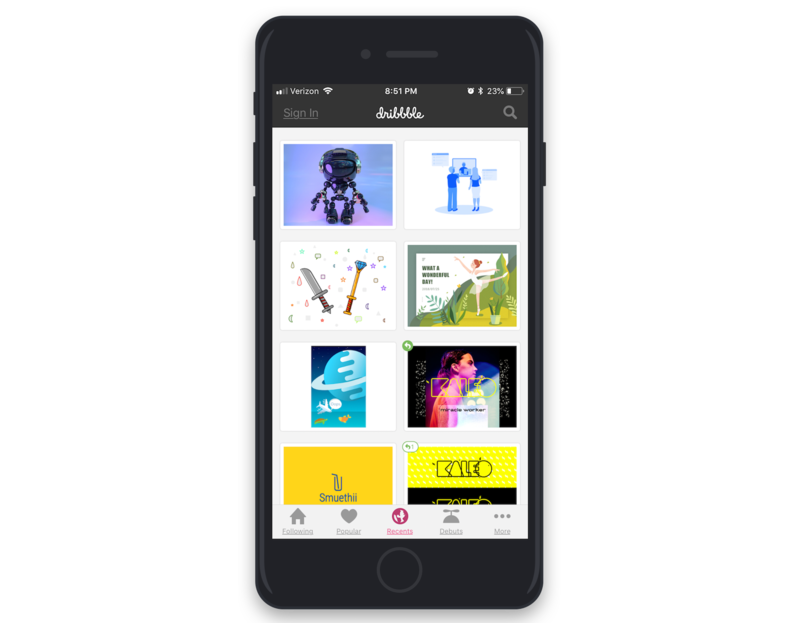 With this mobile app, you can build prototypes and sketches and share them with your team and clients. It’s not only a great design tool, but it’s especially helpful when it comes to more effectively communicating and collaborating. 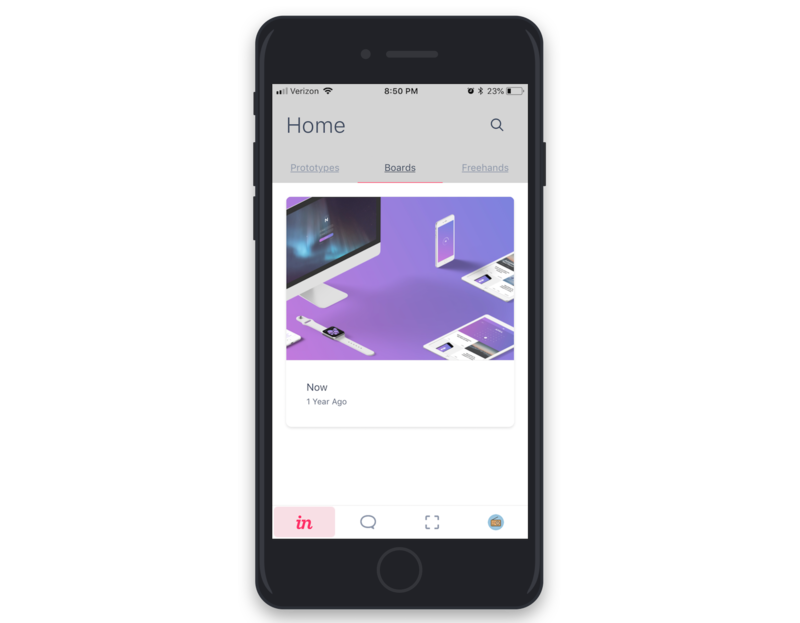 Dribbble’s mobile app is another tool every web designer should keep on hand. Even though you’re out of the office, you can still look to a site like Dribbble for quick inspiration or for easy access to templates. Communicate in real-time (or, at the very least, more quickly). Provide high-quality work to clients even when you’re out of the office. Maintain consistency between the work you do at home and the work you do on the road. Stay productive even when you’re not surrounded by a distraction-free workspace. If you’re hoping to make the most out of freelancing life (and digital nomadery), set yourself up with these must-have mobile apps for greater productivity and success.